Image caption Kathleen Wyatt has been told the £1.9m payout she hoped to secure from Dale Vince is "out of the question"
A woman has won a landmark Supreme Court bid to claim cash from her millionaire ex-husband, 20 years after they divorced. 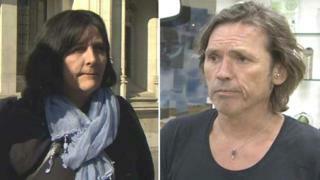 Kathleen Wyatt, 55, first took legal action against Dale Vince, 53, founder of wind-power firm Ecotricity, in 2011. Mr Vince had previously appealed against his ex-wife on the basis she had lodged the claim too late. But five Supreme Court justices unanimously ruled Ms Wyatt's case should go before the family court. Delivering the ruling, Lord Wilson said the court must have regard "to the contribution of each party to the welfare of the family, including by looking after the home or caring for the family". Mr Vince and Ms Wyatt met as students in their early 20s and married in 1981. The pair had a son, Dane, and lived a New Age traveller lifestyle before their divorce, the court heard. Mr Dale set up his company, Ecotricity, in 1995 after the pair had split. He is now worth an estimated £107m and has an OBE. Lord Wilson said Ms Wyatt, who lived in Lowestoft, Suffolk, Sunderland and the Forest of Dean, had raised her son through "16 years of real hardship". Her claim was "legally recognisable" and not an "abuse of process", he said, although the £1.9m payout she had hoped to secure was too high an amount. "It is obvious, even at this stage, that an award approaching that size is out of the question," he said. This is a striking ruling that underlines the fact there is no time limit for ex-spouses to apply to a court for a financial settlement following a divorce - however weak their claim may be. Whereas there are strict time limits in other claims, such as those for breach of contract or personal injury, these claims can clearly be made decades after the divorce itself. The judgment is also a timely reminder that divorcing couples who want protection from such claims, even if they have no money at all, should obtain an order from the court at the time of the divorce, in which they both agree that there will be no further financial claims. That is the only way to guarantee that, if one of them goes on to make a fortune, they get to keep it. "Her claim may even be dismissed. "But there is, in our opinion, a real prospect that she will secure a comparatively modest award, perhaps of a size which would enable her to purchase a somewhat more comfortable, mortgage-free home." In a statement, Mr Vince branded the court's decision "mad". "I feel that we all have a right to move on, and not be looking over our shoulders," he said. "This could signal open season for people who had brief relationships a quarter of a century ago." Mr Vince said the time gap was "extremely prejudicial" and the fact there was "no paperwork in existence" had enabled the claim. It was "hard to defend yourself" under such circumstances, he said. Ms Wyatt, who now lives in Monmouth, lodged her first claim for "financial remedy" in 2011. Outside court, Ms Wyatt's lawyer Barbara Reeves said her client had been through a "very difficult time" and was pleased the High Court would now be able to consider her claim. "She looks forward to concluding the litigation as quickly as possible," she said. Image caption Outside court Ms Wyatt's lawyer Barbara Reeves (right) said her client had been through a "difficult time"